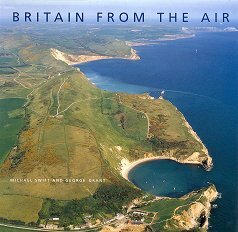 Many photographs of buildings, towns, and natural features from the air (but not from very high in the air -- see Britain from Space for altogether higher views). Some shots are stunning; a few are too close-up to give a really different perspective. Some of the photos are a little overexposed in my copy (but it was a remainder), leading to a somewhat cardboard-cutout feel to the buildings. I find it fascinating that even for those towns I know quite well, I find it difficult to recognise routes from the pictures -- maybe I'm too used to maps? But the views of natural features show the 3D topography of the land in ways that maps cannot.